Everybody has fond childhood memories of visiting Santa's grotto for the very first time. This Christmas you can treat your kids to the same, as Santa takes time out from his busy schedule to make several important grotto appearances throughout London. Explore enchanted spaces within the Royal Albert Hall. Children and their families are taken on an hour long Christmas experience through enchanted spaces within the Royal Albert Hall, guided by magical characters, before meeting the big man himself. There will be games, storytelling and songs and every child will have the chance to meet Father Christmas, sit in his sleigh and receive a present. The great hall is a magical place at any time of year and lends itself particularly well to a behind-the-scenes tour at Christmas. The experience can be enjoyed by all ages but is most suitable for children aged between three and eight. Children hear a festive fairytale in an 'audience with' Father Christmas. Part of Christmas in Leicester Square, when Underbelly's spiegeltent and a Christmas Market are set up, Santa's Grotto comes to the very heart of London. Children can meet the man in red in person and tell him what's top of their wish list. They'll hear a festive fairytale, meet Father Christmas and his helpers and receive a gift. Sessions are for groups of up to 20 children and are up to 25 minutes long and the beauty, for parents at least, is the ticket is per child, with one accompanying adult. Babies under two can accompany for free but will not receive a gift. Visit Santa at this beautiful 105-acre wetland wildlife oasis in Barnes. 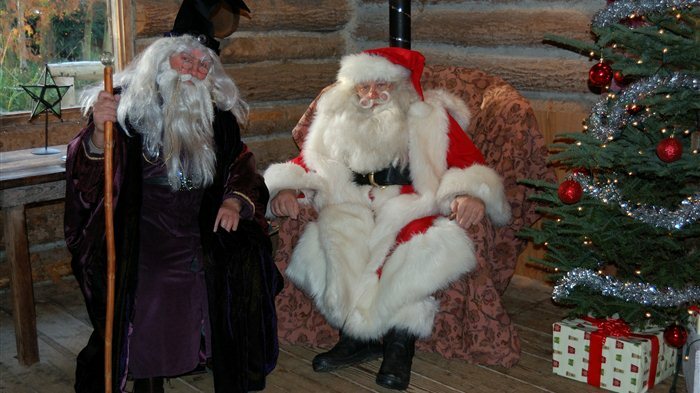 Always a hugely popular outing for west London families at this time of year, Father Christmas will be at WWT London Wetland Centre for two weekends in December. Children can visit the man in red and help the elves make festive decorations or small gifts to take home. Head over to the northern pine forest where Father Christmas will be ready to welcome families in his cosy grotto among the trees, and don't forget to leave time to stroll among the lakes, meadows and ponds of this wonderful 105-acre wildlife oasis in Barnes. Meet Santa and his reindeers from 2pm on Saturday 17th November when the lights are switched on. The pedestrianised Duke of York Square, just off the fashionable King's Road, presents its very own plush Santa's Grotto at Christmas. On a day out with the family, take a break from all of the Christmas shopping at nearby boutiques and head down to the square where little ones can get a meet and greet with Father Christmas. Once inside his whimsical workshop, children can enjoy some magical stories from Santa himself as he gives out some scrummy festive treats. Be sure to pop down to the arts and crafts marquee where you will find some family-friendly activities everyone can get involved in. Father Christmas will be there to turn on the Chelsea Christmas Lights, on Saturday 17th November, with some assistance from his special helper - a local child nominated by family and friends. On the night you can meet real reindeer and afterwards Santa's grotto will be open every Friday, Saturday and Sunday in November and every day in December, apart from Mondays. Meet Father Christmas in the magical setting of Harrods. Visiting Santa's Grotto at Harrods is a long-standing tradition at the luxury Knightsbridge store. Little ones can meet Father Christmas at his grotto and share their wish lists with him but all children, regardless of good behaviour, will be rewarded with a special memento from Santa. Parents have the chance to buy a photograph of their kids enjoying themselves in the grotto. If you want to extend your visit, book in for afternoon tea in The Georgian restaurant or opt for buffet dining in the Disney Christmas cafe. Very young children, aged four or under, are best suited to the pre-school experience where journey through Father Christmas' toy workshop before meeting him in his winter cabin (available Monday to Friday, 10am to 11.30am, throughout November only). Be aware that you must be a Harrods Rewards cardholder in order to book tickets, which can be done on the Harrods website. Treat the children to a day they won't forget as they meet Santa and elf. Father Christmas and his Grotto come to Greenwich's glorious traditional riverside market this Christmas. Children get a chance to see Santa in person and collect their free goodie bag filled with lots of seasonal treats. Also on hand to keep the kids entertained is Santa's funny little helper, elf, who will dazzle the crowds with his magic tricks and balloon fun. Father Christmas arrives at his grotto at 11 Durnford Street next to Greenwich Market on Wednesday 21st November, just in time for the Lantern Parade and switching on of the lights at Greenwich Market. We advise that you plan your visit in advance as the Grotto is open at set times - on weekends in December and then every day in the week leading up to Christmas. Take some time out from all of the whacky and wonderful rides to visit Santa. Throughout late November and December a section of Hyde Park near Hyde Park Corner is transformed into a Winter Wonderland, complete with fairground rides, giant wheel, circus, Christmas market, food and drink stalls, an ice rink and, of course, Santa's grotto. Start your day of fun and games by heading into Santa Land to greet Father Christmas in his beautiful retreat for free. There to tell the kids all about Lapland and his little helpers, Santa will be on site every day from 10am to 6pm. And if the Grotto isn't what all of your kids want to see, there's the Magical Ice Kingdom, a walk-through world of ice and snow with woodland creatures and a unicorn-pulled carriage. Santa's Snowflake Grotto at Westfield London and at Stratford City takes children and their families on a journey to the Snow Factory in the North Pole, where Santa's elves are making all the snow in the world. While in the factory, children will be able to create their very own snowflake and visit Father Christmas. Children can put their Christmas wish list in a cannon to Santa, then see their list zoom up the tube and activate a puff of smoke. They can also look at artificial snowflakes through microscopes and enter the Snow Chamber where they will meet Santa himself. Every child will receive a gift from the big man in red and have a photo taken (available to purchase in the Christmas Shop at the end) before concluding the experience with the chance to experience falling snow. Travel back in time at the Museum of London and Museum of London Docklands. This Christmas, travel back in time at the Museum of London and Museum of London Docklands with the Victorian Santa's Grotto. Both grottos will be set in traditional Victorian streets with festive decorations while traditional carols will add to the atmosphere. Tell Santa your Christmas wishes and receive a special gift, and you can also get a photograph of your child and Father Christmas (for an additional cost). Be sure to leave time to look around the museums. Father Christmas comes to Elizabeth Street to share some of his favourite Christmas stories. Opening the doors to his grotto in Belgravia for two weekends in December, Father Christmas will be inviting lucky children into his log cabin hidden within a festive, winter forest as he shares some of his favourite Christmas stories. Father Christmas in Belgravia returns to Elizabeth Street for a second year where a roaring fire, Victorian Christmas tree and welcoming sofas set the scene for an enchanting moment. Young visitors can tell the big man what they want for Christmas, get their photograph taken with him and will be given a Christmas treat to take home. Visit on Saturday 1st December and you can see a festive edition of Pimlico Road Farmers' Market with carol singers and Christmas treats. Sunday 2nd December brings Belgravia Christmas Sunday to Elizabeth Street with handmade craft stalls, boutique market sellers, children's entertainment, live music and seasonal food and drinks. From cheap budget hotels to luxury 5 star hotels see our deals for hotels, including Holiday Inn London Bloomsbury from 65% off.